Here we have compiled a listing of all state lunch and meal break laws. This state by state listing of laws was compiled from information directly from the Department Of Labor and is given freely for you to use and distribute at will. If you have concerns of the accuracy of this information please refer directly to the DOL or FSLA websites. Currently federal law does not require employers to provide breaks (meal, lunch or rest) to employees. However, if an employer chooses to implement breaks, there are several guidelines that federal law states. If an employer grants a non meal rest break, usually lasting less than 20 minutes, the employer is required to pay employees for the break. 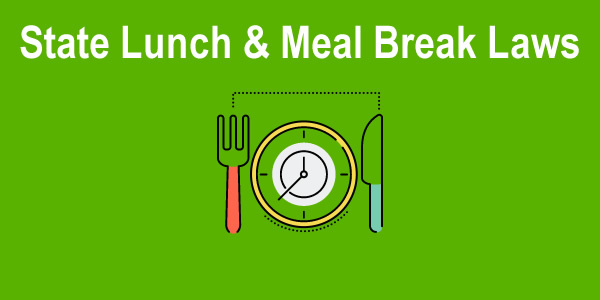 If the employer give a lunch break, typically lasting more that 3o minutes, the employer is not required to pay the lunch break. The FSLA has strict requirements for non-exempt (hourly) employees to be paid for ALL hours worked. These requirements may extend to requirement to pay the employee for meal or lunch breaks even if the break is designated as unpaid. See DOL Document 29 CFR 785.11 for more information. Some employers implement policies to prohibit employees from working during an unpaid break period to mitigate responsibility for an employee inadvertently working during a designated non paid break period. Each state has setup is own lunch, meal and break laws and requirements. Some states have not set up break or lunch requirements at all. Some may have specific requirements for minor employees or requirements only under special circumstances. When a state has not implemented a meal/break/lunch law, federal law applies. Most states as well as the FSLA require employers to pay hourly(non-exempt) employees for all worked hours, regardless if the hours worked were during normal or designated break periods. See DOL Document 29 CFR 785.11 for more information Employers may implement policies to prohibit working during break periods. These policies will help the employer to not be held responsible for employees working during break periods. ½ hour, after 5 hours, except when workday will be completed in 6 hours or less and there is mutual employer/employee consent to waive meal period. On-duty meal period counted as time worked and permitted only when nature of work prevents relief from all duties and there is written agreement between parties. Employee may revoke agreement at any time. An employer may not employ an employee for a work period of more than 10 hours per day without providing the employee with a second meal period of not less than 30 minutes, except that if the total hours worked is no more than 12 hours, the second meal period may be waived by mutual consent of the employer and employee only if the first meal period was not waived. The Industrial Welfare Commission may adopt working condition orders permitting a meal period to start after 6 hours of work if the commission determines that the order is consistent with the health and welfare of the affected employees. Administratively issued Industrial Welfare Commission Orders, and California Labor Code section 512. Uniform application to industries under 14 Orders, including agriculture and private household employment. Exempts employees in the wholesale baking industry who are subject to an Industrial Welfare Commission Wage Order and who are covered by a valid collective bargaining agreement that provides for a 35-hour workweek consisting of five 7-hour days, payment of 1 and ½ times the regular rate of pay for time worked in excess of 7 hours per day, and a rest period of not less than 10 minutes every 2 hours. Exceptions apply to motion picture or broadcasting industries pursuant to Labor Code sections 512 and 226.7, and Industrial Welfare Commission Wage Orders 11 and 12. ½ hour if work shift exceeds 5 consecutive hours. On-duty meal period counted as time worked and permitted when nature of work prevents relief from all duties. Applicable to retail and service, food and beverage, commercial support service, and health and medical industries. Exempts administrative, executive/supervisor, professional, outside sales employees, elected officials and their staff, companions, casual babysitters, and domestic employees employed by households or family members to perform duties in private residences, property managers, interstate drivers, driver helpers, loaders or mechanics of motor carriers, taxi cab drivers, and bona fide volunteers. Also exempt are: students employed by sororities, fraternities, college clubs, or dormitories, and students employed in a work experience study program and employees working in laundries of charitable institutions which pay no wages to workers and inmates, or patient workers who work in institutional laundries. Labor Commissioner is directed to exempt by regulation any employer on a finding that compliance would be adverse to public safety, or that duties of a position can be performed only by one employee, or in continuous operations under specified conditions, or that employer employs less than 5 employees on a shift at a single place of business provided the exemption applies only to employees on such shift. ½ hour, after first 2 hours and before the last 2 hours, for employees who work 7½ consecutive hours or more. Excludes teachers and workplaces covered by a collective bargaining agreement or other written employer/employee agreement providing otherwise. Exemptions may also be granted where compliance would adversely affect public safety; only one employee may perform the duties of a position, an employer has fewer than five employees on a shift at a single place of business; or where the continuous nature of an employer's operations requires employees to respond to urgent or unusual conditions at all times and the employees are compensated for their meal break periods. An administrative penalty of up to $1,000 for each violation may be assessed an employer who discharges or discriminates against an employee for complaining or providing information to the Department of Labor pursuant to a violation of this requirement. At least 20 minutes, no later than 5 hours after the start of the work period, to employees who work 7 ½ hours or more. Each hotel room attendant -- those persons who clean or put guest rooms in order in a hotel or other establishment licensed for transient occupancy -- shall receive one 30-minute meal period in each workday in which they work at least seven hours. Excludes employees whose meal periods are established by collective bargaining. Different requirements apply to employees who monitor individuals with developmental disabilities and/or mental illness. Applies to an establishment located in a county with a population greater than three million. Hotel room attendants may not be required to work during a break period. Break area must be provided with adequate seating and tables in a clean and comfortable environment. Clean drinking water must be provided without charge. Employer must keep complete and accurate records of the break periods. Reasonable off-duty period, ordinarily ½ hour but shorter period permitted under special conditions, between 3rd and 5th hour of work. Not counted as time worked. Coffee breaks and snack time not to be included in meal period. Excludes employers subject to Federal Railway Labor Act. Meal period requirement does not negate collective bargaining agreement or mutual agreement between employer and employee. 30 minutes after 6 consecutive hours, except in cases of emergency. Not applicable to places of employment where there are fewer than 3 employees on duty at any one time and the nature of the work allows those employees frequent breaks during the workday. Not applicable if collective bargaining or other written employer-employee agreement provides otherwise. 15 minute break for 4-6 consecutive hours/ 30 minute break for more than 6 consecutive hours. If an employee works 8 or more consecutive hours, the employer must provide a 30-minute break and an additional 15 minute break for every additional 4 consecutive hours worked. Applies to retail establishments. To clarify, a retail establishment is an employer whose primary purpose is to sell goods to a consumer with the consumer present in the retail establishment at the time of sale, and does not include restaurant or wholesalers. This law applies only to employers who are engaged in a retail business (or who own retail establishment franchises with the same trade name) with 50 or more retail employees for each working day in each of 20 or more calendar week in the current or preceding calendar year. Employees who work in certain retail establishments are entitled to a non-working shift break depending upon the number of hours worked. 30 minutes, if work is for more than 6 hours during a calendar day. Excludes iron works, glass works, paper mills, letter press establishments, print works, and bleaching or dyeing works. The Attorney General may grant exemption to a factory or workshop or mechanical establishment, if in discretion of the Attorney General, it is necessary by reason of continuous process or special circumstance, including collective bargaining agreement. Sufficient unpaid time for employees who work 8 consecutive hours or more. Rest periods of less than 20 minutes may not be deducted from total hours worked. Excludes certain agricultural and seasonal employees. Meal period requirement does not prohibit different provisions under collective bargaining agreement. ½ hour, off premises, for lunch in each 8-hour shift. Applicable to assembly plant, workshop, or mechanical establishment, unless employee is covered by a valid collective bargaining agreement or other written agreement between an employer and employee. ½ hour, if work is for 8 continuous hours. Applicable to employers of two or more employees. Excludes employees covered by collective bargaining agreement. ½ hour, after 5 consecutive hours, unless feasible for employee to eat while working and is permitted to do so by employer. Labor Commissioner may give written permission for shorter meal period under each standard. 30 minute noonday period for employees who work shifts of more than 6 hours that extend over the noon day meal period. All other establishments and occupations covered by the Labor Law. An additional 20 minutes between 5 p.m. and 7 p.m. for those employed on a shift starting before 11 a.m. and continuing after 7 p.m.
1 hour in factories, 45 minutes in other establishments, midway in shift, for those employed more than a 6-hour period starting between 1 p.m. and 6 a.m.
½ hour, if desired, on each shift exceeding 5 hours. Administratively issued Minimum Wage and Work Conditions Order. Applicable when two or more employees are on duty. Collective bargaining agreement takes precedence over meal period requirement. Employees who are completely relieved of their duties but required to remain on site do not have to be paid. ½ hour, with relief from all duty, for each work period of 6 to 8 hours, between 2nd and 5th hour for work period of 7 hours or less and between 3rd and 6th hour for work period over 7 hours; or, less than ½ hour but not less than 20 minutes, with pay, with relief from all duty, where employer can show that such a paid meal period is industry practice or custom; or, where employer can show that nature of work prevents relief from all duty, an eating period with pay while on duty for each period of 6 to 8 hours. Applicable to every employer, except employees covered by collective bargaining agreement. In absence of regularly scheduled meal periods, it is sufficient compliance when employer can show that the employee has, in fact, received the time specified (permitted only where employer can show that ordinary nature of the work prevents employer from establishing and maintaining a regularly scheduled meal period). All employees are entitled to a 20 minute mealtime within a six hour work shift, and a 30 minute mealtime within an eight hour work shift. Uniform application to all employees except to an employer of a licensed health care facility or an employer who employs less than three people on any shift at the worksite. ½ hour for employees scheduled to work 6 consecutive hours or more. The meal break shall not be scheduled during or before the first hour of scheduled work activity. Applicable to every employer, except in workplace environments that by their nature of business provide ample opportunity to take an appropriate meal break. An employer may waive the right to a thirty-minute unpaid meal break pursuant to the voluntary written request of an employee who is principally employed in the service of food or beverages to customers and who, in the course of such employment, receives tips and reports the tips to the employer. Employees are to be given "reasonable opportunities" during work periods to eat and use toilet facilities in order to protect the health and hygiene of the employee. ½ hour, if work period is more than 5 consecutive hours, to be given not less than 2 hours nor more than 5 hours from beginning of shift. Counted as worktime if employee is required to remain on duty on premises or at a prescribed worksite. Additional ½ hour, before or during overtime, for employees working 3 or more hours beyond regular workday. Excludes newspaper vendor or carrier, domestic or casual labor around private residence, sheltered workshop, and agricultural labor. 2/ Rules for construction trade employees may be superseded by a collective bargaining agreement covering such employees if the terms of the agreement specifically require meal periods and prescribe requirements concerning them. Director of Labor and Industries may grant variance for good cause, upon employer application. 20 minutes for employees who work 6 consecutive hours or more. Applicable to every employer. Meal period is required where employees are not afforded necessary breaks and/or permitted to eat lunch while working. ½ hour, after 5 hours, except when workday will be completed in 6 hours or less and there is mutual employer/employee consent to waive meal period. Not considered time worked unless nature of work prevents relief from duty. Excludes agriculture where fewer than 10 are employed, domestic employment, and fishing industry, among others. 1 hour, after end of 3rd but before beginning of 6th consecutive hour worked. Double-time pay required for work during meal hour or fraction thereof. Excludes domestic service; and public sector employment other than agricultural, industrial, commercial or public service enterprises. Meal period may be shortened for convenience of employee by mutual employer/employee consent and with approval of Secretary of Labor. Such consent and approval not necessary if union and employer agree on shorter period. Requirement for a second meal period for employees working up to 10 hours may be waived with approval of Secretary of Labor. The following 35 jurisdictions also have separate provisions requiring meal periods specifically for minors (when minors are covered by two provisions, employer must observe the higher standard): Alabama, Alaska, California, Colorado, Delaware, Florida, Hawaii, Illinois, Indiana, Iowa, Kentucky, Louisiana, Maryland, Massachusetts, Michigan, Minnesota, Nebraska, Nevada, New Hampshire, New Jersey, New York, North Carolina, North Dakota, Ohio, Oklahoma, Oregon, Pennsylvania, Rhode Island, Utah, Virginia, Washington, West Virginia, Wisconsin, Guam, and Puerto Rico. In addition to the States with Standards of general application a 30-minute meal period is required for seasonal farm workers after 5 hours in Pennsylvania, and for migrant workers in Wisconsin after 6 hours. In Washington State, although agricultural labor is excluded from the listed requirement of general application, a separate regulation requires a 30-minute meal period after 5 hours in agriculture and an additional 30 minutes for employees working 11 or more hours in a day. In addition to the listed States with mandatory Standards, other provisions appear in two States: New Mexico. A provision applicable to females and administratively extended to men does not require a meal period, but provides that when a meal period is granted (in industrial, mercantile and certain service industries), it must be at least ½ hour, not counted as time worked. Wisconsin. By regulation, the recommended standard is ½ hour after 6 consecutive hours' work in factories, mechanical and mercantile establishments and certain service industries, to be given reasonably close to usual meal time or near middle of shift. Not displayed in table are exemptions for executive, administrative and professional employees, and for outside salespersons. Of the 21 States or other jurisdictions with meal period requirements, 7 States also have rest periods requirements (California, Colorado, Kentucky, Minnesota, Nevada, Oregon, and Washington). California law also exempts construction workers, commercial drivers, private security officers, and employees of utility companies if the employees are covered by a valid collective bargaining agreement which provides for the wages, hours of work, and working conditions of employees, and expressly provides for meal periods for those employees, final and binding arbitration of disputes concerning application of its meal period provisions, premium wage rates for all overtime hours worked, and a regular hourly rate of pay of not less than 30 percent more than the state minimum wage rate. The Information provided is intended for reference only and is not tax or legal advice. It was gathered from the references below. Contact your Tax Professional and Legal Advisor to verify and determine if and how this information may apply to your situation.